Soak rice and urad dal separately in water for 4 hours. Add Fenugreek to the rice. Beat urad dal well and grind it. Rice should be only coarsely ground. For dosa batter, rice should also be ground well as urad dal. To this add curry leaves and salt and keep the mix for at least 8 hours. 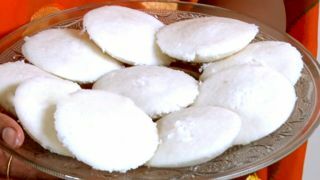 Steam idlies in idli cooker by spreading oil in each mold. For dosa, spread the batter in a dosa pan and cook by pouring 1 tsp of oil on it.